Phyllis Eileen Byrnes passed peacefully from this earth to be with our Lord on November 15, 2018. She was surrounded by family. Mass of Christian burial will be 10:30 a.m., Tuesday, November 20, 2018 at Assumption Catholic Church (1906 Sycamore, Granger, IA). A visitation will be held 5 to 7:00 p.m., with Rosary at 7:00 p.m., Monday, Nov. 19th, also at the church. Phyllis was born to George and Mary Yost on February 3, 1935. Growing up she enjoyed ice skating, swimming and playing baseball barefoot with the neighborhood boys, earning the nickname 'fleet feet'. She loved spending time at her grandparents' farm during the summer, being in the country and helping out with the chores. In 3rd grade, she went to a one room school house, 4th – 8th grade at Visitation, 9th grade at Amos Hiatt Middle School and 10th – 12th at East High. After high school she worked for the telephone company until she married. Phyllis met Edward Joseph Byrnes at St. Gabriel's Monastery of Passionate Monks during Lent. They were married on September 11, 1955 at St. Peters, Des Moines Iowa. Later, after her youngest child was in school, she worked briefly delivering films to schools. In 1970 Phyllis and Edward started a successful upholstery business. 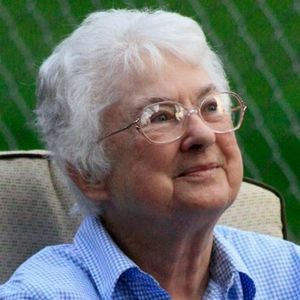 She enjoyed swimming, reading, quilting, making clothes, going to daily mass, bible study, playing cards, doing the Jumble and the crossword puzzles and watching the World Series. Phyllis lived every day for her family and in the spirit of the Lord. She was a genuinely sweet and kind woman and truly saw the best in people. She was loved dearly by her family and will be missed. Heaven gained an Angel. She was a devoted wife and mother and a devout Catholic, praying the rosary and novenas daily. She attended daily mass at Assumption Parish and assisted in mass preparation. They had 12 children; Stephen Michael Byrnes (Deceased) [Mary Beth], James Edward Byrnes [Shelly], Patricia Marie Thomas [David], Peggy Suzanne McCombs [David], Joseph Patrick O'Byrnes [Kathleen], Daniel Thomas Byrnes [Julie], Edward Francis Byrnes [Juli], Anne Elizabeth Leopold [John], Mary Cecilia Byrnes, Richard Dennis Byrnes [Betsy], Dennis Michael Byrnes (Deceased) and Matthew John Byrnes [Jamie]; 27 grandchildren, 24 great grandchildren and 1 great-great grandchild.She is also survived by her brother Joseph Albert Yost (Delores Jean) from Noblesville, Indiana. She was preceded in death by her parents, 3 sisters, Rosemary, Rita and Ruth Ellen and 2 of her sons. My heart and prayers go out to all of you. Phyllis is a big part of my childhood memories. I was blessed to know her. Always remember her smile... She was my mom's best friend and I know she will be greatly missed. I am sorry for your loss. At 1 Corinthians 15:26, there's a promise for a future without death. May God give you peace and strength to endure this tough time. So sorry to hear of the loss of Phyllis. The Byrnes family supported my practice for many, many years and I have some great memories of working especially with papa Ed, those cute twins Pat and Peg,....and of course, mama Phyllis. I can't imagine even having a 'herd' of 12 kids,...as I was lucky enough to have two girls,...but if anyone could do it, the Byrnes had to top the list!! Was sorry to hear of the loss of you wife and mom. Prayers and thoughts going out to you during this time. So sorry to learn of Phyllis' passing. We apologize that we won't make the visitation or funeral. Len is pretty frail now, so we won't attempt, but know that our thoughts are with you Ed, and your family. Rich & family, my condolences to you, during this difficult time.